In 1997 DIC Entertainment released the animated series Mummies Alive! The premise is very mummy-y. Evil sorcerer Scarab kills the Pharaoh’s son but is entombed alive for his crime (why do they never KILL these guys? It’s always entombed ALIVE). He revives in modern day (1997) and searches for the reincarnation of the prince he killed. However, the prince’s protectors are also revived to protect him from harm. It’s a constant battle to keep Scarab from getting his hands on the reincarnated prince. The prince’s guardians are all mummies each with the power of an Egyptian god. Ja-Kal uses the spirit of falcon, Rath uses the spirit of snake, Armon uses the spirit of ram, and Nefer-Tina uses the spirit of cat. They are able to call upon these powers for magical armor and abilities. And in typical “cartoon magical transformations” form they call on the powers when they are in immediate danger but then it takes 30 seconds or more for all four mummies to fully transform and by then, in reality, they’d all be dead. To trigger their powers, the mummies call out the phrase “With the Strength of Ra!” Using these magical abilities depletes their strength, so once their strength is exhausted, they must rest in their sarcophagi to regain their abilities. Along with Scarab, the mummies had to contend with a litany of Egyptian gods and monsters like Anubis, Set and Sekhmet. But the best episode has to be the one where the mummies actually take a tour of Alcatraz (not even kidding). Here’s the cartoon version of Alcatraz Island. 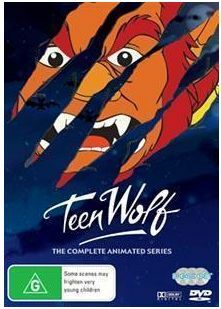 The show only ran one season but managed to pump out 42 episodes. Unlucky episode 13. This will probably end up being “creepy” episode 13. Our topic this week is to discuss our cartoon crushes. Yes we talk about cartoon people that we find attractive. And to up the creepiness factor, we categorize them into categories like “Dream Date”, “The One That Got Away”, “Bad Girl”, etc etc. So not only do we actually have to think about our crushes and put a label on them, most of the cartoon crushes we talk about are supposed to be, well, a little younger than us. So yeah, we toe the line of being awesome and getting a visit from Chris Hansen. In a move designed to make this episode seem less creepy and lecherous, we are joined by Kristin from the Geek Girls Network. You are going to love her, she’s hilarious. And yes, we actually talk about half human half turtle babies. We go there. And Kristin is the one to bring it up. I am so in love with this episode. Anyway, download this episode from iTunes, Zune Marketplace or listen to it on Feedburner. Again, this is a very visual topic (like the Nerd Decor episode) so I thought I’d give you guys a visual reference to some of my cartoon crushes. These are in no particular order, listen to the podcast to see what category in which I put these lovely ladies. Supergirl (Kara-Zor El) – Introduced in Batman/Superman in 2003 by Jeph Loeb and drawn by Michael Turner. Elise – From the SSX snowboard video game franchise. Madelyn Pryor – AKA The Goblin Queen. Evil clone of Jean Grey. Created by Mr Sinister and featured in Marvel’s Inferno crossover event in 1989. Invisible Woman – From the Marvel Ultimate universe.